This book consists of 21 chapters dealing with various aspects of practical feeding of dairy animals with respect to use of nutritious fodder like berseem, lucerne, maize, jowar, bajra etc. as well as agro industrial by products and other feed ingredients and feed additives. The food safety, bio security of livestock and manufacturing of traditional milk products have also been touched upon. 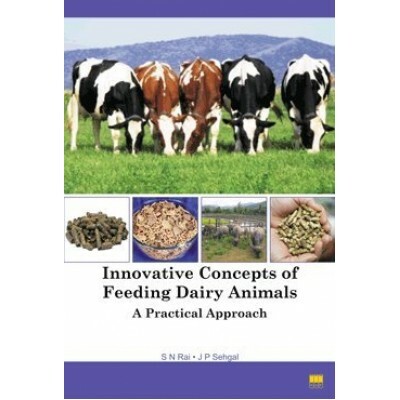 Earlier published books on animal nutrition describe feeding practices prevalent in developed countries implying the use of good quality green fodder and not of under developed countries like India, where the animals are fed largely on cereal straws and other agro industrial by products. The feeding standard, feed specification and feeding systems that adopted in developed countries are no more relevant under Indian conditions. Therefore, the need of the day warrants a kind of information given in a gist form with full clarity at a place showing nutritional aspects of feeding Indian bovine population. This book provides latest information about practical approach of feeding cows and buffaloes for higher productivity. It will be of a great interest to veterinary and animal husbandry teachers, graduates and researchers, animal feed manufacturers, veterinary and agricultural field representatives and marketing officers dealing with feed ingredients, animal feed, feed additives etc. progressive dairy farmers, and policy makers, libraries of SAU and ICAR institutions for general reading.